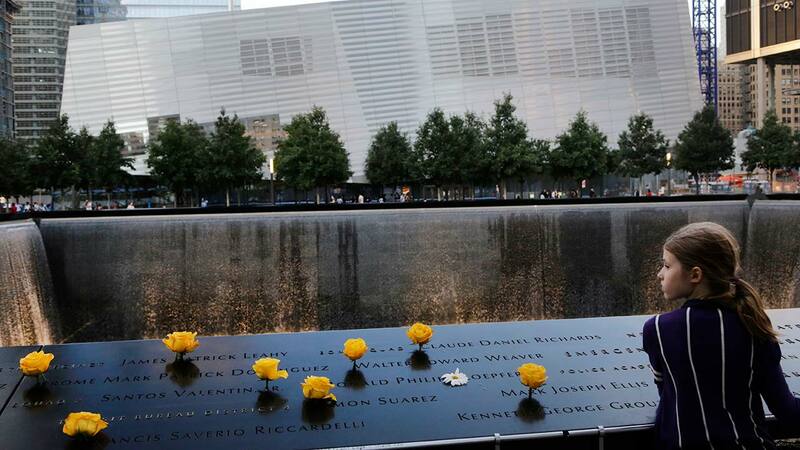 NEW YORK -- It is a somber day as people in New York City and across the country remember the 9/11 terror attacks. Tributes and memorial services are marking the day in the Tri-State. The events of 9/11 and the lives lost are never forgotten. Family and friends of the victims attending the remembrance ceremony will be greeted with several new changes to the World Trade Center area. Candace McCowan reports from Lower Manhattan. The World Trade Center Cortland Street subway stop for the 1 train recently reopened. It was destroyed, but after 17 years and $158 million it's back in business. All of the improvements are dedicated to those who lost their lives. "We really believe the best tribute we can perform for them is to bring back the World Trade Center site and campus with more energy and more vibrancy than ever before," said Rick Cotton, Port Authority Executive Director. Large murals were also added. Tower 3 reopened in June and now Towers 2 and 5 are being planned. The ceremony is set to start at 8:39 a.m. followed by the first moment of silence at 8:46 a.m. as churches throughout the city toll their bells.